Fruits, as we all know, are great for health. But what if fruits were great for your fortune as well? Well, look no further, because, in fact, they are. Fruity Fortune Plus, presented by Multislot, actually makes that happen. 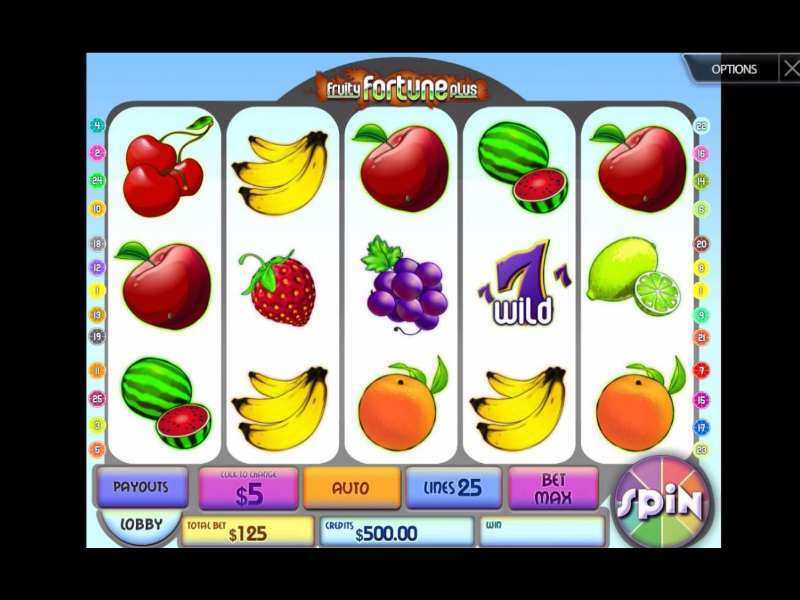 So try your luck at Fruity Fortune Plus slots while you enjoy the wonderful theme that has been incorporated into the slot machine, which is basically lots and lots of fruits, such as cherries, bananas, limes, apples, watermelons, oranges, strawberries, grapes, as well as a fruit cocktail and another classic and very popular symbol, the purple sevens. Fruity Fortune Plus is available for playing online and supports gameplay from smartphones as well. It is absolutely free to play and requires no registration or sign-up and no download. So, play free Fruity Fortune Plus online slot machine to satisfy your desire for fruits and win a lot of real money if you are lucky enough. Fruity Fortune Plus online, which can be played from various online casinos, is loaded with a plethora of features, which coupled with the fun-filled and user-friendly interface, provides for a wonderful gameplay experience to the player. 5 Reels, 3 Rows, and 25 Pay lines: Fruity Fortune Plus slots consists of the conventional 5 Reels and 3 Rows and a total of 25 Pay lines. The Wild Symbol: The Wild Symbol in the game is a purple sevens symbol, with “Wild” written above it. The Wild symbol may substitute all the symbols for the benefit of the player so that he may land a winning combination, except the Bonus and Scatter Symbols. The Bonus Round Symbol: the Bonus Round Symbol: the Bonus Round Symbol is represented by a Golden Bell and initiates the Bonus Round feature when 3 such symbols are landed on a pay line. In the Bonus Round, the player is given a hovering sword, which he has to use in order to slice fruits that pop up from below, by swiping in any direction. The Scatter Symbol: The Scatter symbol is a fruits cocktail image, with “scatter” written on it. The Scatter symbol plays the purpose of awarding free spins to the player. Landing at least 3 Scatter symbols rewards the player with free spins, while a maximum of 75 free spins may be obtained by landing 5 scatter symbols anywhere on the game screen. The Fruit Cocktail icon, therefore, is one of the most important ones as it dramatically increases the number of chances available to the player to try out his luck. The interface has quite a few buttons, which serve various purposes. The “Spin” button sets the reels in motion and begins the game. The “Auto” options begin the autoplay feature, which continues to spin the reels until the same button is pressed again. The “Payouts” button displays the coins to be paid for landing particular sets of symbols. The “Click to Change” button is used to adjust the coin size. The “Bet Max” button is to be clicked for betting all accumulated credits on a particular spin.The “Credits” option displays the credits available to the player for betting. The game is over when the available credits become 0. The Jackpot to be won in the game is 10000 coins, which is a lot, considering the other similar slots of the genre and is certain to raise a few eyebrows. To win the Jackpot payout, the player has to land the purple sevens symbol on all 5 of the reels, with no other symbol interrupting. However, for those who miss it by a whisker, consolation has also been arranged for, as landing 4 purple sevens results in a payout of 1500 coins and further, landing 3 or 2 purple sevens leads to payouts of 150 and 10 coins respectively. Fruity Fortune Plus is particularly a hot favorite with those who are high – rollers, i.e, who want to bet more to get more. But what steals the show for the slot is the interactive bonus round feature, which acts as a mini-game within the game and is quite interesting, keeping in mind that not too many online casino slots games provide such a wonderful bonus round. These are the features which make Fruity Fortune Plus one of the best online casino slot games both internationally as well as in the UK, where it is a popular choice for seasoned as well as casual betters. So, enjoy the fruity rewards of the amazing Fruity Fortune Plus online casino slots. 0 responses to "Fruity Fortune Plus Slot"